I did this walk on Tuesday 22nd January 2008. 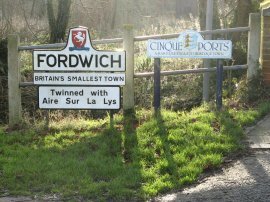 I drove down and parked on the A28 in Sturry, close to Sturry Station from where it was just half a mile back to the town of Fordwich to resume my walk along the Stour Valley Walk. Reaching Fordwich, photo 1, I headed along Kings Street, following the road around to the right and then turning left down School Lane which soon becomes a footpath which leads out into fields on the edge of Fordwich. 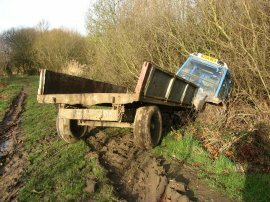 A short distance along the path I came across a tractor that had fallen into a ditch beside the field, photo 2. I could tell from the tyre tracks that this had only happened quite recently although it was very hard to see how the tractor could have left the broad level path beside the field and ended up where it was. The fields I was passing through seemed to being used as nurseries for trees and there were a number of rows of different types of young trees planted across them, photo 3. 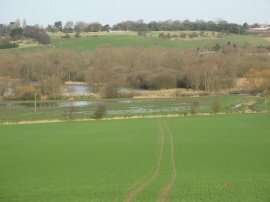 To my left there were occasional glimpses of some quite large stretches of water in the Stour Valley, photo 4. Leaving the fields the route continues ahead through a patch of woodland, photo 5, which I think is part of Trenley Park Wood, heading gently uphill. Away to my left I could still occasionally see the lakes in the Stour Valley through the trees. The day had started bright and still with plenty of hazy sunshine which made for very pleasant walking conditions, I have known far worse days in mid summer! 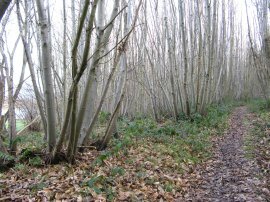 It was also very peaceful walking through the woodland, the only sounds being the chattering of birdsong and the damp leafy earth smelt particularly pleasant as I passed between the trees. At a bend in the track through the trees, just before Higham Farm is reached, the route bears right out of the woodland and into an open field near the top of a hill. 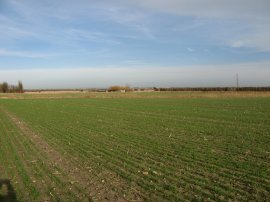 From the field there were far reaching over towards the Isle of Thanet, photo 6. In the fields beside the Great Stour in the valley below there was a considerable amount of flooding, photo 7, and I was glad that at this point the path was running high above the valley floor. 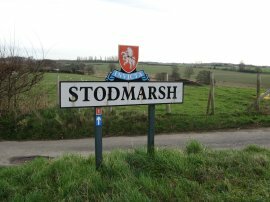 The route heads along the left hand edge of one field and then diagonally across the middle of the second to reach a road where the route takes the fork signposted Stodmarsh, 1 ¼ miles. Reaching a couple of houses on the right the route then takes a footpath off to the left into a field. 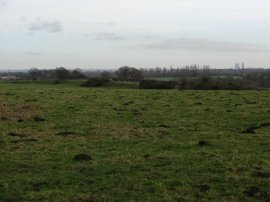 The road had been running along the top of a ridge and when I entered the field I was able to see the towers of the old Richborough Power Station ahead of me, photo 8, along with the very prominent tower block that is on the outskirts of Ramsgate. 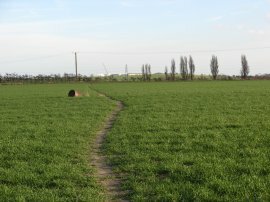 Having crossed over the middle of this long and rather narrow field the route rejoins the road as starts heading downhill into the village of Stodmarsh, photo 9. Just past the Red Lion pub the route bears left along a lane that runs down to the Stodmarsh National Nature Reserve. 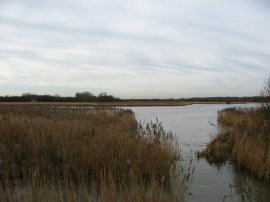 Stodmarsh National Nature Reserve covers 241 hectares of wetland and is characterised by extensive reedbeds, lakes and associated bird populations. 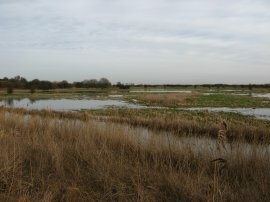 It is a Special Protection Area and also a Wetland of International Importance under the Ramsar Convention, the reserve is managed by English Nature. 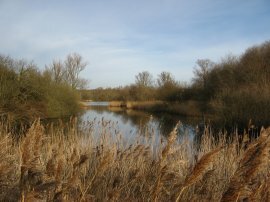 It was really pleasant walking along the path as it wound its way through the very extensive reedbeds of the nature reserve, photo 10. The whole of the Stour Valley Walk has been really enjoyable so far and this section of path was one of the real highlights. I don't think I have ever walked through such a large expanse of reedbeds before and I spent a lot of time as I passed through looking for birds and wishing I had my binoculars with me. 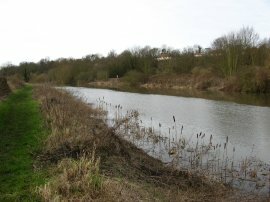 Eventually the route joins the bank of the Great Stour River, photo 11, as the Stour Valley Walk makes its way alongside the river down to Grove Ferry. The Stour has been tidal since just above Fordwich and as I was walking down alongside the river I could see from the ripples on the surface that the tide was heading gently in. Once again the grassland besides the river contained a lot of water, photo 12. As I approached Grove Ferry the river, photo 13, was much higher than I had seen it before and on the opposite bank, which I had recently walked along when walking the Wantsum Walk, parts of the path were under water in a number of places. Fortunately the bank I was on was considerably higher, running along the top of what is presumably an old flood bank. 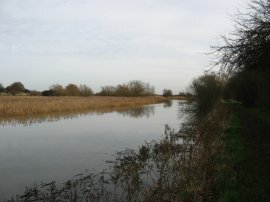 At Grove Ferry the Stour Valley Walk links up with the route of the Saxon Shore Way for a short distance. I stopped to eat my sandwiches in the picnic area at besides the river before continuing alongside the River Stour. 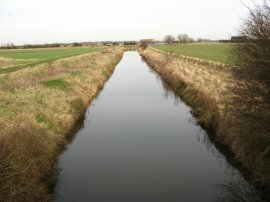 After a short distance the route leaves the course of the river and heads across a couple of fields to join the bank of the Little Stour River. 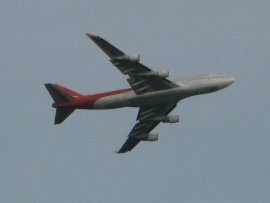 For much of the morning as I was walking along there was a big plane, photo 15, flying quite low overhead. I presume either doing some testing or pilot training from Manston Airport. Reaching a bridge the route crosses over the Little Stour, photo 16, and continues ahead towards the village of West Stourmouth as the Saxon Shore Way bears off to the left. Reaching a road the route turns left and then right through the churchyard of All Saints Church at West Stourmouth, photo 17. 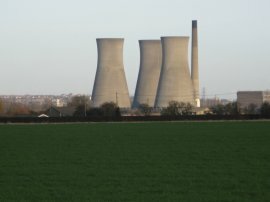 Leaving the churchyard the route continues ahead over fields, the towers of the power station looming ever larger on the horizon, photo 18. 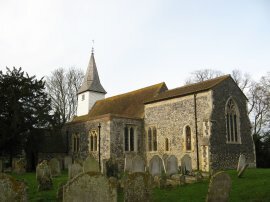 Whilst now several miles inland, as the name suggests Stourmouth was once where the River Stour met the sea. As I walked along I could see the aeroplane mentioned earlier landing at Manston Airport away to the left, the top of its fuselage and tail fine just visible on the horizon. Reaching some houses at East Stourmouth the route turns left and then right down School Lane. Reaching a bigger road the route turns right for a short distance before taking a footpath off to the left that runs between a hedge lined path opposite the Rising Sun Pub, the signpost being rather hidden on the other side of the road besides the pub. This path soon leads out into orchards. 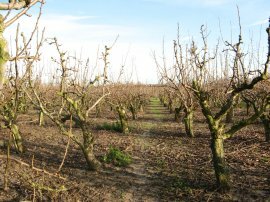 The path then continues ahead through the orchards before passing through a narrow gap in a hedge and turning left, still running through orchards. Reaching a drainage ditch the route turns right for a very short distance then left to take a slightly lopsided bridge, photo 20, over the ditch. 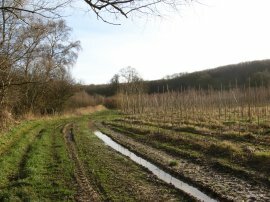 The path runs over a small section of field, which was quite waterlogged when I passed through, and on into more orchards. It was a lovely bright sunny afternoon with no wind at all and the sun felt very warm on my face. It really was mild for the time of year and so calm and still, perfect walking weather in a really beautiful part of the world and I was really enjoying the walk. Leaving the orchards the route heads over another field, photo 21, to reach a road in the village of Westmarsh. 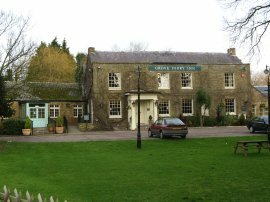 The route continues ahead, following the road through the village, before taking a footpath off to the left which runs over open fields, photo 22. As I was walking along this stretch of path the aircraft that had been accompanying me for most of the day once again took of from Manston and began flying overhead. Heading towards Corner Drove the Stour Valley path took an unmarked path across a field of small fruit bushes, photo 23, unfortunately I don't know what type of bushes they actually are. As I was walking along I completely missed this path and ended up doing a slight detour to rejoin the correct route on the other side of the field. Here the route of the path was way marked and for completeness I quickly went back across the field to complete that part of the walk that I had missed out! Reaching a road at Paramour Street the route turns left, then right, to head across through more orchards. 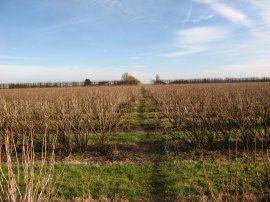 The route passes a large fruit packing plant and at the next road near the Stour Valley Walk once again heads straight across passing a few early flowering daffodils. 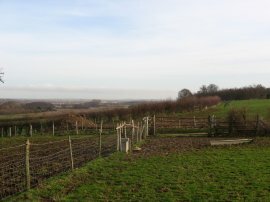 The route runs along the right hand edge of the orchard for a short distance before taking a footpath that runs diagonally to the left through the trees themselves, photo 24. 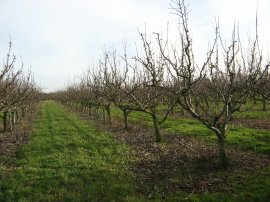 There was muck spreading going on in a nearby field and for a while the air smelt pretty ripe as I passed through the orchard. Reaching a road the route once again continues straight ahead still running alongside orchards. 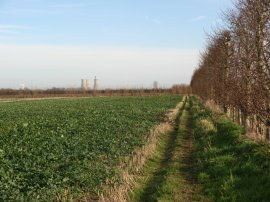 Leaving the orchards the route then heads across a couple of open fields with the cooling towers of Richborough Power Station away to the left, photo 25, as the buildings of the industrial estate on the edge of Sandwich appeared on the horizon, photo 26. 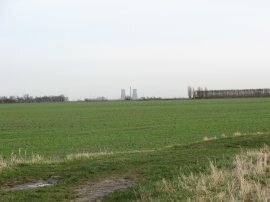 The route crosses another minor road and heads over another field just to the right of an electricity pylon. 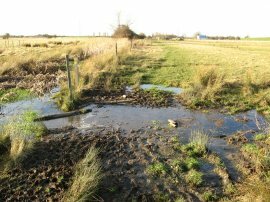 The route crosses over a wooden bridge over a drainage ditch and then headed over a particularly muddy and boggy stretch of field that had been very churned up by sheep. Despite all the rain that had fallen recently I had managed to keep my boots and trousers quite clean up to this point but soon they were covered in mud which was a bit of a shame as I was so near to the end of the walk. After one last boggy patch of field, photo 27, the route heads up over what looks like the remains of an old railway embankment and down to cross another minor road. 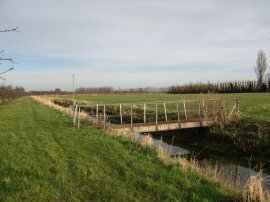 The route crosses this and then crosses over some railway lines before turning to the right to link up with the route of the Saxon Shore Way as it makes its way into Sandwich, once again running alongside the Great Stour River. 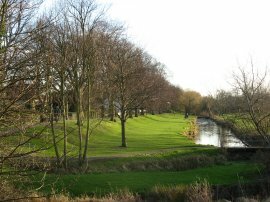 The route passes under the rather noisy A 256 flyover and soon the track besides the river runs into join a road where the route of the Stour Valley Walk continues straight ahead. Reaching the end of Richborough Road the route turns left for a short distance before turning right along the Butts which is also part of the old town wall of Sandwich, photo 28. The Butts crosses Woodnesborough Road and leads into The Rope Walk, still following the line of the old town wall. Reaching another road I left the route of the Stour Valley Walk to make my way down to Sandwich Station. At this point I had walked 14.4 miles for the day. The trip back to Sturry cost £5.20 which seemed quite excessive for just two stops and the journey took some time. 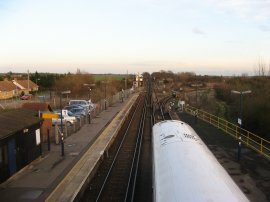 I had arrived at Sandwich Station about half an hour before the train was due, having walked slightly quicker that I had thought I would. Reaching Minster Station, photo 29 I then had to change trains and it was another half hour wait until the next train for the one stop to Sturry arrived. Whilst it had been lovely and warm when I was out walking it began getting quite chilly while I was waiting for the second train. In general though this had been one of the best walks I can ever remember doing let down only ever so slightly by the rather muddy field near Sandwich and the road walk into Sandwich itself. The actual end of the Stour Valley Walk is at the western edge of Pegwell Bay some three or so miles from Sandwich and rather in the middle of nowhere. Hopefully I will be able to walk that stretch of path before too long.